For The Lyric Feature, this two-part documentary vividly brings to life the story of 17th and 18th century garden-making in Ireland as broadcaster Mary Brophy explores the influences, characters and obsessions that made Ireland’s great historic gardens and landscapes. Here Mary Brophy explains what drew her to this fascinating history. About ten years ago, I went to the Chelsea Flower Show. It was the prospect of a weekend in London that persuaded me; the flower show was for my mum, a gifted plants woman who hadn’t yet managed to cultivate any horticultural leanings whatsoever in her children. But at Chelsea, I fell down a rabbit hole. Into a world of design and beauty and art. As ever with a new interest, I started to research. Taking tentative steps in my own garden, I read gardening books and learned a little about how to grow plants. Or at least how not to kill them. But as I went deeper I discovered that in gardens there lay a path back to incredible histories, especially in the 17th and 18th centuries, a period described as a golden age in garden making. During this age of reason and scientific discovery, gardens came to signify man’s dominion over nature and a powerful elite spent fortunes creating grand designs as the ultimate status symbol. I learned how layers of meaning were built into garden designs to reflect the culture and politics of the day and to publically demonstrate their owners’ knowledge and education. This was also a time of Empire and as that Empire expanded into new worlds, exotic plant species flowed back from the colonies, sparking an insatiable mania for the new, and fetching ridiculous auction prices. Much has been written and aired about English great gardens such as Chatsworth or Stowe, or designers like William Kent and Lancelot ‘Capability’ Brown but I wanted to find out how Irish great gardens, some of the most beautiful in the world, fit in this picture? And so the idea to make ‘Politics, Pleasure & Empire’ took shape. Grand gardens are all about visual spectacle which some might consider a challenge for radio but for this Lyric Feature, I wanted to explore the people and influences behind some of our historical gardens as much as the gardens themselves. 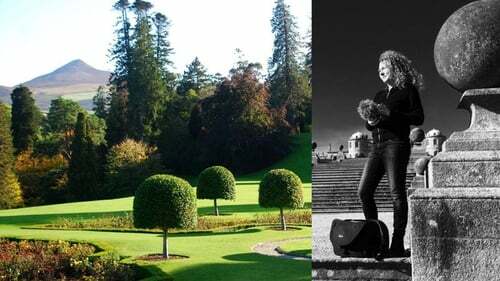 Across the short series, I visit some of the surviving great Irish gardens like Kilruddery and Powerscourt meeting their current stewards as well as some forgotten ghosts like Moira or Breckdenstown. And I find a story populated with extraordinary characters whose ambition and obsessions fuelled their creations. Like Sir Arthur Rawdon, the Ulster Protestant who raised an army against the Jacobites during the Williamite wars yet at the same time was fixated on acquiring West Indian plants for his garden at Moira and built what’s believed to be the first hot-house in Europe. Lady Louisa Connolly who took refuge from her very public, aristocratic life in her designed landscape at Castletown Demesne. Or the ardent Whig Robert Molesworth who fretted and preened over every detail of his grand garden in Swords while sourcing plants and trees from the King’s nurserymen and his wide network of contacts. Making this story I had many, great conversations with historians, botanists and gardeners including Finola O’Kane Crimmins, Turtle Bunbury, Lord Meath, Vandra Costello and Dr. Matthew Jebb. With their superb contributions the series places Irish garden making into the context and influences of the time. And while Ireland was then part of the British Empire, this story is not the same as 17th or 18th century garden making in England. Set as they were here against a terrible backdrop of war and poverty, these beautiful spaces were made on a contested stage and so as the series draws to a close, I ask how we regard them, how we see that legacy through a contemporary prism. ‘Politics Pleasure & Empire: Making Ireland’s Great Gardens’ is an IWR Media production for RTÉ Lyric FM funded by the Broadcasting Authority of Ireland with the Television Licence fee. Episode 1 of "Politics, Pleasure and Empire: The Making of Ireland's Great Gardens" will be broadcast on The Lyric Feature, at 6pm on Sunday 19th of November with the second episode on Sunday 26th of November at the same time.